1 Chocolate Cake (as above) or 1 Devils Food Cake (your choice) Slit into 3 layers. 2 x 425 grams PITTED black cherries. Drain and reserve the cherries and juice/liquid separately. Of these keep at least 8 cherries aside and let them drain on a kitchen towel so as to remove as much juice as possible. Take the liquid/juice in a saucepan and heat it gently. Mix the corn flour/arrowroot with two tablespoons of the juice and return it to the pan. Do not let it boil but let it heat gently and add the cherries back to the pan. Once you have a thickened saucy cherry sauce take it off the heat and let it cool. You can do this a day ahead of time and keep it in the fridge. 12 or more Leaves from Roses or any Leaves that have a well defined shape and veins. Clean with a damp cotton cloth and pat dry making sure they do not have any moisture clinging to them. 1 bar of 70% Dark Chocolate grated. 1 Packet Chocolate Hail. If you can not source Chocolate Hail then use grated Chocolate instead. 1 Chocolate should be enough. - Place a sheet of baking paper or any waxed paper on a flat surface. Separate the leaves and place them in a bowl. - Keep a very small spatula or a butter knife handy. - Melt half the grated chocolate on a double boiler and once it is nice and glossy smooth remove from the boiler and wipe the bottom to ensure no water gets in. Add the other half of the Chocolate and continue stirring. This is known as tempering the chocolate and it helps the chocolate set well. The result should be a smooth and glossy chocolate sauce. - Carefully “paint” the back of each leaf with this Chocolate. You can even use your fingers if you find it difficult to use a knife or brush. Place each leaf carefully on the baking sheet, Chocolate side up. Once you have finished all the leaves you need to do put the baking sheet with the leaves in the fridge and leave for 20 minutes. Remove from the fridge and carefully peel of the leaf and you will be left with perfect Chocolate Leaves. Believe me, it sounds more fiddly than it is!! These can then be stored in an air tight container and kept in a cool place for later use. The rest of the chocolate can be grated and used to decorate the sides. Place the Bottom layer of the cake on the serving platter and bruh with a third of the Kirsch, top with a layer of cream and half the cherry sauce. Repeat with the middle layer. Now place the final layer of the cake and brush with the remaining third of the Kirsch. 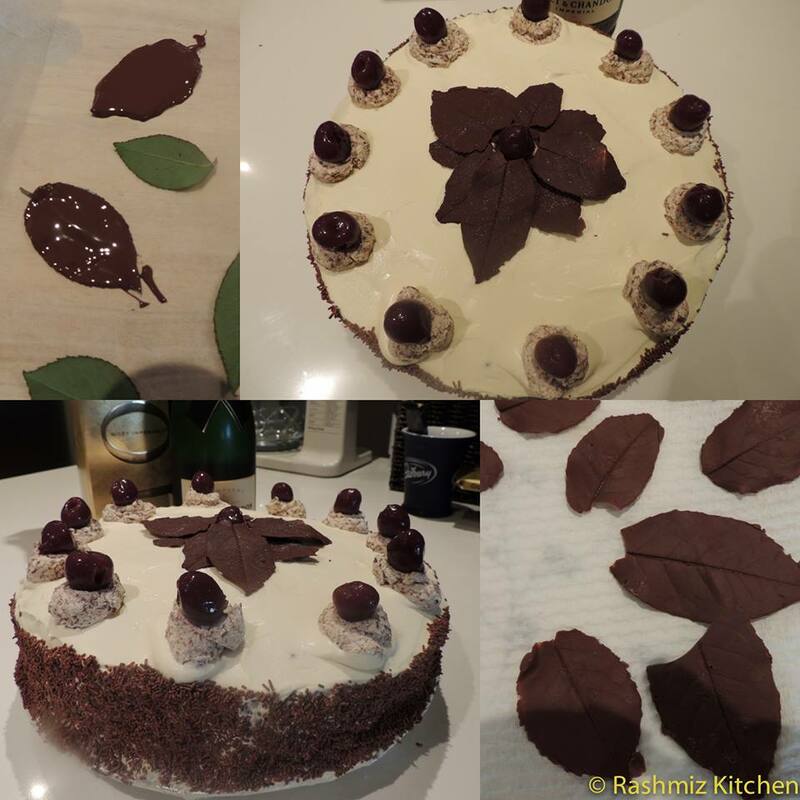 Cover the top and sides with cream and decorate with the cherries and chocolate leaves on top and the chocolate hail or grated chocolate on the sides. 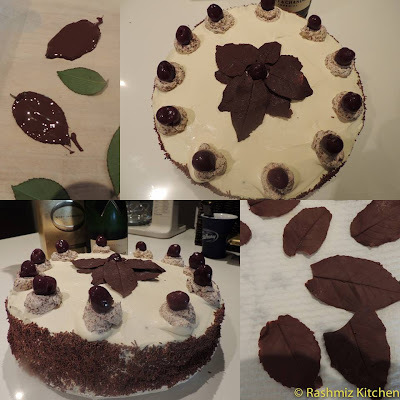 Beautiful luking cake n Nice Idea of making leaves ..tempting..
My sister's favorite was the Devil's Food Cake Recipe that she got from one of her friends. She always talks about it whenever we meet!. Black Forest Cake looks delicious! I’m definitely making this! thanks for sharing!